What defines a team’s success? Is it based solely on achievement, or is there more to the story? The best leaders know a successful team is created when focus, care, attention, and development are directed to its members. Healthy teams yield fulfilled employees, effective collaboration, high organizational engagement, and greater long-term success. In 2019, Leadercast Live will bring experts in organizational health to help attendees master the art and science of developing and leading healthy teams. Speakers include: Patrick Lencioni, Ginger Hardage, Andy Stanley, Caroline Leaf, Tripp Crosby, Julie Funt, and Craig Springer! 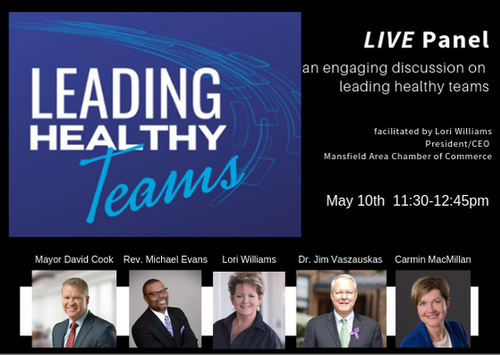 For the first time since its inception, Leadership Mansfield is excited to have a live panel discussion on Leading Healthy Teams during the lunch hour. The discussion will be facilitated by Lori Williams, President/CEO of Mansfield Area Chamber of Commerce. The panel will include Mayor David Cook, Mansfield Texas, Reverend Dr. Michael Evans, Bethlehem Baptist Church, Dr. Jim Vaszauskas, Superintendent Mansfield Independent School District, and Carmin MacMillan, Executive Director of Mansfield Mission Center. A boxed lunch can be purchased with your ticket so you don’t miss this engaging discussion.